Kennewick, Washington, is the largest of the Tri-Cities in beautiful southeastern Washington state. 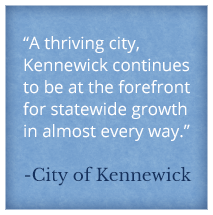 A thriving city, Kennewick continues to be at the forefront for statewide growth in almost every way, and with a steady job market, low cost of living, and over 300 days of sunshine each year, Kennewick is a great place to live and to visit. Our location along the Columbia River provides a variety of recreational activities. Take a look at some of our local attractions, and find out why we love it here. Columbia Park – This park, with its several hundred acres of riverfront land, offers fabulous nature/wildlife areas and a variety of recreational opportunities. Visit this beautiful park with miles of walking paths, and enjoy your lunch on a warm summer day near the fishing pond. Be sure to bring the kids because there are plenty of toys, a skate park, hydro board races, and much more to keep everybody happy and entertained. One of Columbia Park’s main attractions is the Regional Veterans Memorial, where visitors can pay tribute to our past and present troops of all the armed forces. This attraction received the 2014 Certificate of Excellence. Toyota Center – Kennewick is the host city of the Tri-City Americans hockey team as well as the Indoor Football League's Tri-Cities Fever. They both play their home games in the Toyota Center, which hosts many other regional events. 911 World Trade Center Memorial – Located at Hildebrand Blvd and Hwy 395, this memorial to the nearly 3,000 victims and heroes of the 2001 terrorist attack on our country will leave you and your family even more grateful than you already are for the freedoms we hold sacred. This attraction received the 2014 Certificate of Excellence. Columbia Center Mall – This great indoor/outdoor mall is a signature spot of the Tri-Cities. Its amenities include a vibrant kid-friendly play area, a vast indoor shopping mall with food court, and an attached outside walking mall. Here you’ll also enjoy a movie theater and some of the top dining venues in the entire Tri-Cities area. City Hall - 210 W. 6th Ave.